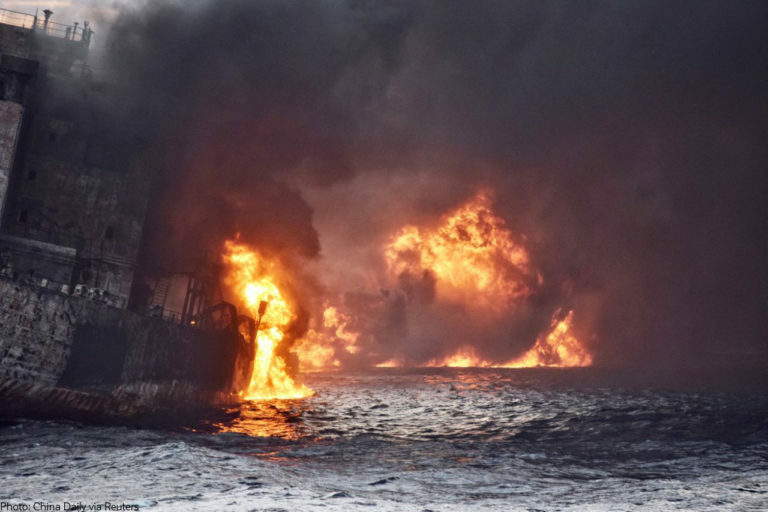 Leaving an ocean of fire, and the largest oil spill since 1991 in its wake, MV Sanchi exploded and then sank to the bottom of the Pacific on January 14. As state resources from two of Asia’s most powerful countries stood by — unable to respond or contain the disaster — British Columbians got a firsthand look at just how easy it is to sink an oil tanker. At least that would have been the case if media gave it more than cursory coverage. I’m trying not to bash the press because I know many of them are doing the best job they can in difficult circumstances. However when it comes to Kinder Morgan, I’m concerned their institutional bias gets in the way of good coverage. What you won’t hear is this: The fiery sinking of the MV Sanchi and the complete loss of its entire cargo is far more likely than not to happen on B.C.’s coast if this project is built. You won’t hear that for a couple of reasons. The first is because it’s a scenario too horrific to contemplate. If people were to internalize what this would actually look like and what it would mean for our coast, it would pull so many people off the fence the public backlash would kill this project once and for all. Secondly, and more nefariously, you don’t hear about this because the National Energy Board’s [NEB] approval process was so flawed, Kinder Morgan itself decided how this project’s risk would be evaluated. To get at the information the NEB received on how likely a tanker sinking off our coast is, you have to go deep. Kinder Morgan’s application contained 21 volumes. This is where the media gets my sympathy: The assessment of marine spill risk was tackled in volume 8A – which alone contained 764 pages of documentation. Little wonder when it comes to the project’s impact on safety and the environment, the coverage is less than enthusiastic. So spoiler alert here: I’ve read it, and the Sanchi scenario — where a double-hulled tanker goes down in a burning toxic stew of chemicals and crude and ejects all its cargo — according to Kinder Morgan, it’s so unlikely it wasn’t even considered. Yet here we are. For risk-assessment geeks, I can tell you what our industry-captured regulator weighed when considering the pros and cons of the project. It’s called the “credible worst case scenario” and in Kinder Morgan’s case it is this: A loaded, escorted tanker strikes Arachne Reef in Haro Strait spilling 104,000 barrels (less than one sixth of the average Aframax carrying capacity). Western Canada Marine Response Corporation (WCMRC) deploys to the scene (note: from a planned but not currently existing facility in Sidney on Vancouver Island). Spill containment booms are applied. The probability this will occur according to Kinder Morgan? Once every 1,326 years. Recent history suggests much less predictable outcomes. In 2015 It took 12 hours to find and contain a simple spill on a calm day in Burrard Inlet. That same year our Coast Guard failed to contain a stricken Russian freighter which lost power and nearly ran aground in Haida Gwaii. In late 2016 it took 32 days to raise the Nathan E Stewart off a reef near Bella Bella. The response to all these incidents can be generously described as totally inadequate. So when Trudeau says “If I thought this project was unsafe for the B.C. coast, I would reject it”, that notion of safety most likely comes from his chief of staff who spoke with a deputy minister who has been briefed by a consultant who had read the approval recommendation and concluded the chance of a small spill is so remote it’s nothing to worry about. In other words, he is living in the same dream world as Catherine McKenna where they can build pipelines and save the environment at the same time. Reality is much different, as you can see if you were watching the same news feeds I was. Doubled hulled tankers go down and spill everything. That condensate you heard about — the stuff that was still burning on the surface of the ocean as the Sanchi slipped under the waves — that’s what makes it possible to put tar in a tanker. The reality is these spills are never contained. In an operating environment where independent royal commissions cannot even conclude what will happen in a real-world marine spill scenario involving bitumen, they place an already compromised environment — not to mention an urban area where millions of people live — in unacceptable peril. I’m asking you to wake up from that dream and look out your window. The real world reflects reality a lot better than industry consultants do and that reality doesn’t just happen once every 1,326 years. Tanker catastrophes are in the habit of happening an ocean way. Until they don’t. Join the movement to defend B.C.’s coast from Kinder Morgan’s seven-fold increase in oil tanker traffic. Want to learn more about the Sanchi oil tanker tragedy and whether something similar could happen in B.C.? Check out our podcast. Why didn’t the double hull prevent the collision of the freighter from penetrating the cargo holds? Doubled-hulled tankers are promoted as being 100% safe. So it is past time to work together to sue our government if they don’t immediately put an end to Corporate servitude and environmental devastation!!! Words that should be shoved down their bloated greedy throats! Yes! YES! YES!! If I remember correctly from the time this promise was floated as the answer to spills….double hulled tankers were already in use…but were now being marketed as some 100% firewall. We’re so out of touch with natural and human disasters we actually buy the spin that there’s a fail safe way to tranport this stuff. It’s not true. Thanks, Christina. I did manage to find articles on the Sanchi. Actually my husband and I had both heard a long piece on CBC Radio about the collision LAST week, but didn’t connect it because this Dogwood article did not mention China or condensate, and the only date mentioned here was Jan 15 (which is incorrect), and I hadn’t recalled the name of the ship. I knew I hadn’t heard of a ship sinking this week. We are so lucky that the CBC is not under anyone’s thumb like the other mainstream media. Oops! That should be January 14 — thank you for catching that. If oil leaks or spills outside the primary containment.. the outer hull traps it… and retains it , along with bilge and/or ballast water … until it can be safely transferred for proper disposal or reclamation….The double hulls DO NOT protect the cargo in a collision.. The DOUBLE HULLS do NOT prevent collisions.. Remember the Exxon Valdez..?? captained by a man 5 weeks outa a rehab facility for alcoholics..
Carolyn King?? answer for your husband is………..U Tube! Would he believe a New York Times article? When an oil tanker flies a “Flag of Convenience”, you can expect that liability is non-existent. Kinder Morgan’s liability ends at the terminus station and even then leaky pipelines upstream are not reported. To think that a 63-year old pipeline is structurally and metallurgically sound is to believe in the tooth fairy. Enbridge’s pipeline that ruptured and spilled 1 million gallons of bitumen oil into the Kalamazoo River was 40-years old. $1.5 Billion later and it’s still causes health issues for the citizens of Michigan, as well as the for the environment and river. Get your news from democracynow.org it’s on you tube and it’s a news organization in new York that gets zero funding from corporations and consequently covers things mainstream news organizations don’t. However I do recall swing a brief piece about this on the national at some point this last week. KM figures that the probability is 1 in 1326 years they forget to mention that that 1 year may be this year. I have to agree with all of this and am against those huge tankers going up and down the coast. But consider this. If Canada stops the Kindermorgan pipeline we would be on the hook for millions and millions of dollars that the corporation already spent ? Why? Does Canada not have an agreement that if they do not follow through with a project that has been approved by the government of the day that country is liable for the money put into the project? And furthermore, that same country In this case Canada would be liable the the loss in profit for the corporation. That “100% safe” claim applies to collisions on rocks and up against solid objects. It doesn’t account for explosions (or perhaps airborne terrorist attacks precipitating explosions) where the hull blows apart like a firecracker under enormous pressure. That’s when the sparks fly, cargo spills and conflagration-level marine fire ensues while consuming the flammable skim on surrounding spilled oil. Read the article: explosion precipitated this spill. I’m going to take the contrarian view and say that the writer of this article has not done any serious research on the subject of tanker safety, and further, does not understand statistical methodology. Read the actual, publicly available incident reports of the Westridge Terminal since its opening in the 1950s and then talk about risk. All this hyperbole from Dogwood and the rest of the commenters is tiring. I would challenge you to post this comment, although I fully expect it was not get through the moderator. I look forward to engaging with a thoughtful protestor. Thanks for the comment Tom. I take issue with the protester characterization. I’ve been on this coast since 1973 and I’m proud to defend the jobs in our marine economy that give definition to what it means to be British Columbian. Though I don’t claim the mantle of expert, as a former inspector in Burrard Inlet I’m confident of my assessments. The NEB accepted scenarios that underestimate likelihood and consequence – fatal flaws in processes that approve projects based on the balance of risk. Real events like the Sanchi, which provide clear examples of what a credible worst case scenario should look like, and real events on our coast demonstrating the inability of our marine responders to contain spills are as far from hyperbole as possible. To honour those who lost their lives, let us record here that 32 people died in the explosion.